Blue Patina Rustic Copper Earrings with All natural blue copper patina, geometric textured earrings. These earrings were handcrafted from copper sheet, blue patina is created with natural fumigation method using salt and ammonia. No fake painted on patina here! Earrings are coated with two coats of clear coat to seal in the patina. These copper earrings have that popular ultra rustic look, with surprisingly bright blue natural patina. Go rustic! Rustic long copper blue patina dangles with Swarovski turquoise accents. 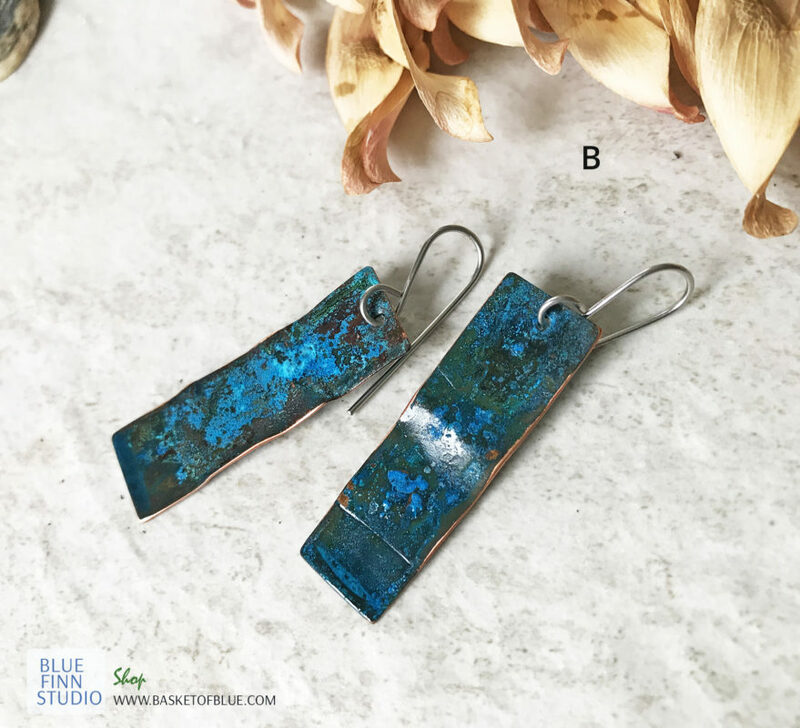 These copper earrings were handcrafted by me from copper sheet, the blue patina is created with all natural method fuming the copper with ammonia and salt. 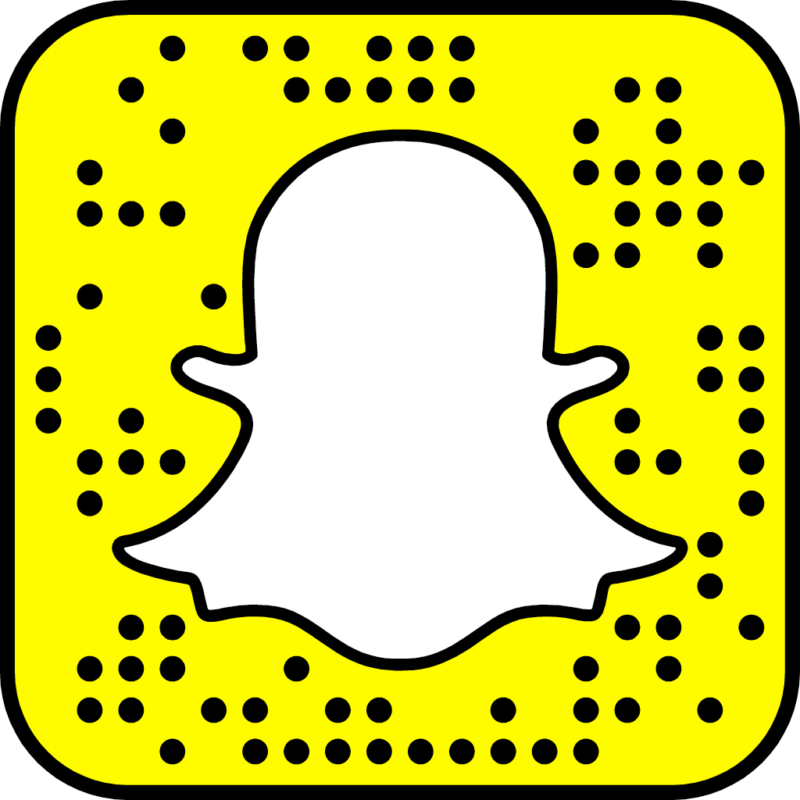 This process takes days and you have totally genuine organic results! Copper shape is 1 1/4″. total earring length is 2 1/2 inches. Handcrafted stainless steel earwires. Blue patina rustic copper earrings. Lightly textured, angular triangle shape patinated with all natural fumigating method, sealed with clear coat. All naturally grown authentic patina, there is no painted on color! Rustic patina hammered geometric copper shapes with natural fumed blue ammonia and salt patina. 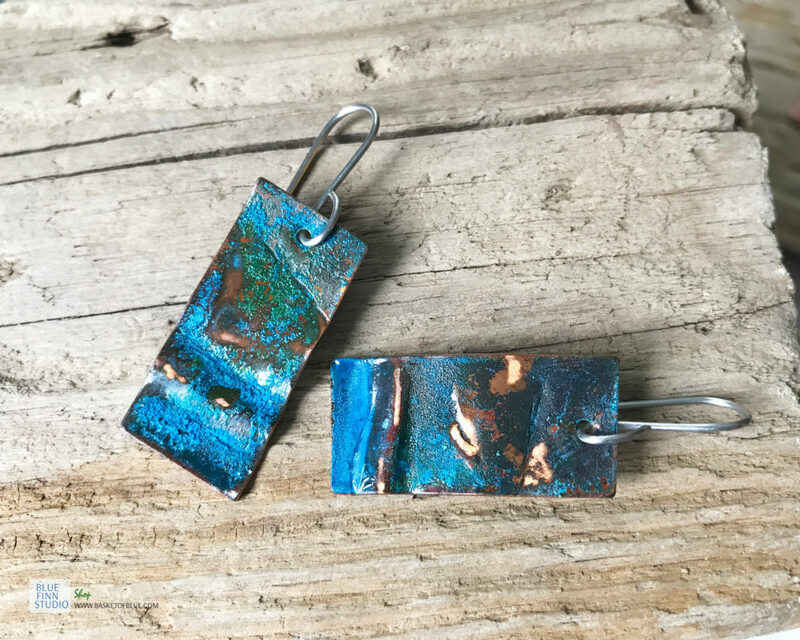 Rustic blue copper patina earrings, hammered rectangle copper shapes with rustic folds. 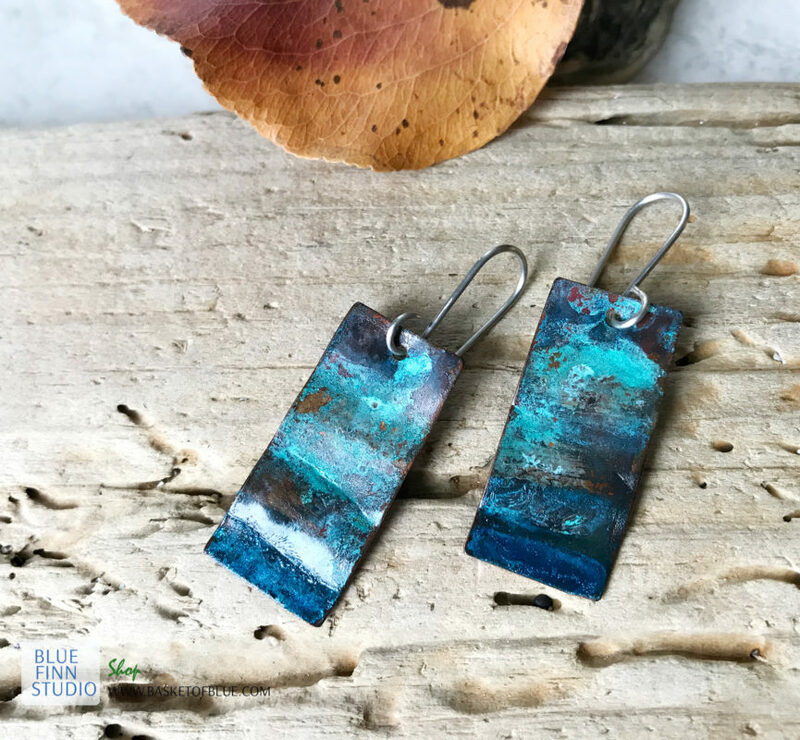 These patina earrings were handcrafted from copper sheet, blue patina is created with natural fumigation method (using ammonia and salt – the method takes several days to grow real patina), the lighter patina is created using a patina accelerator. Earrings are coated with clear coat to seal in all the goodness of the patina. 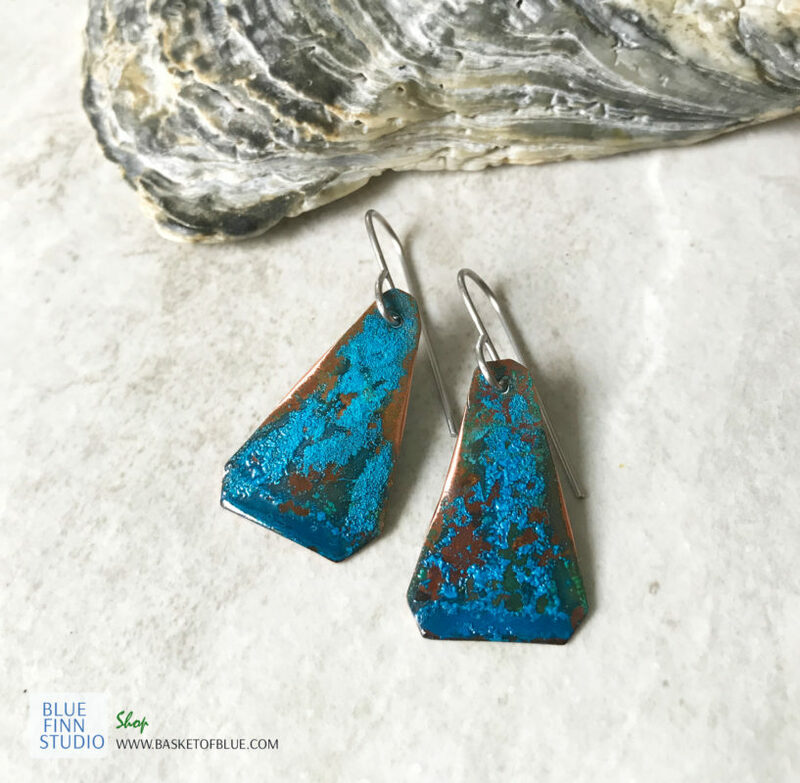 These copper earrings have that popular ultra rustic look, with both bright blue patina and dark patina, with a fun texture on the patina as well. Go rustic! The copper shapes are 1 1/8 inches high. Total earring length is about 1 3/4 “. Handcrafted stainless steel earwires. (hypoallergenic). 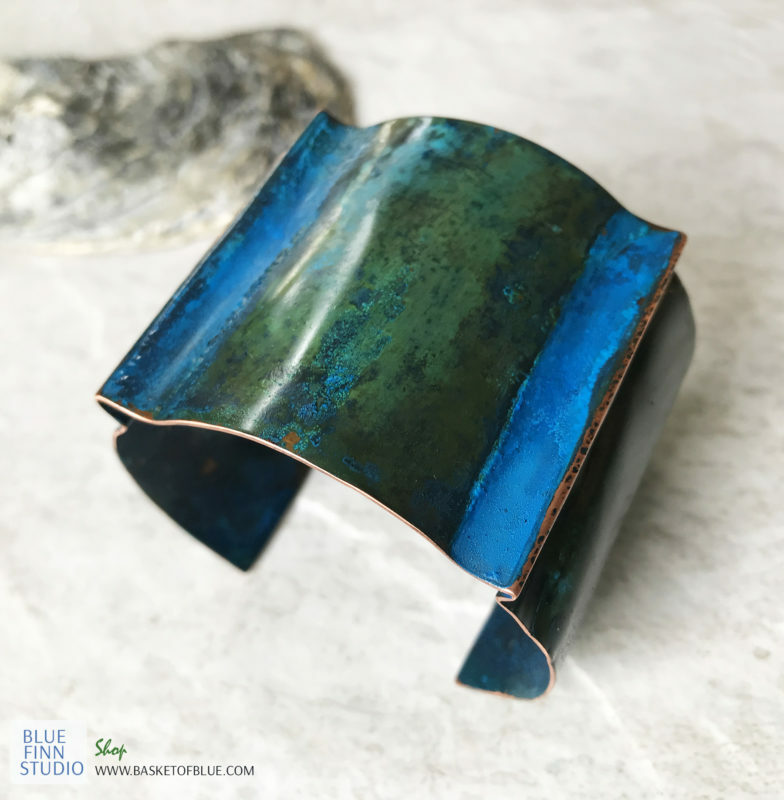 Blue Copper Patina Cuff, rustic natural patina on copper. Hammered and fold formed with two central folds to create a unique shape. This cuff bracelet has copper exposed for a fun look and highlights. Great rustic jewelry with wonderful color! Sealed with high grade jewelry clear coat. The copper is 24 gauge thickness. The cuff is formed on a medium size mandrel (7″) – ideally for about 6 – 7 inch wrist. It can be adjusted for a bit larger or smaller. Don’t know how to put a cuff on? You roll it sideways onto your wrist through the cuff opening. There is a soft spot higher in your wrist where you can actually push the end of a cuff in a bit and then roll. Every cuff has unique patina that is grown naturally for several days. Blue green patina earrings, rustic long rectangle with naturally created organic patina. These copper patina earrings are produced naturally with the exposing method. (copper is suspended in a container with fumes of ammonia and salt) These copper earrings have that popular ultra rustic look, like you just found them in nature. Unique handmade one of a kind patina! Copper Blue Patina Shell Necklace, naturally grown patina on copper. Handcrafted from pure copper sheet, formed and shaped using hand tools. This patina is the real thing! It is created using ammonia and salt fuming method that takes several days to grow naturally. Coated with high quality jewelry clear coat to seal in the patina. 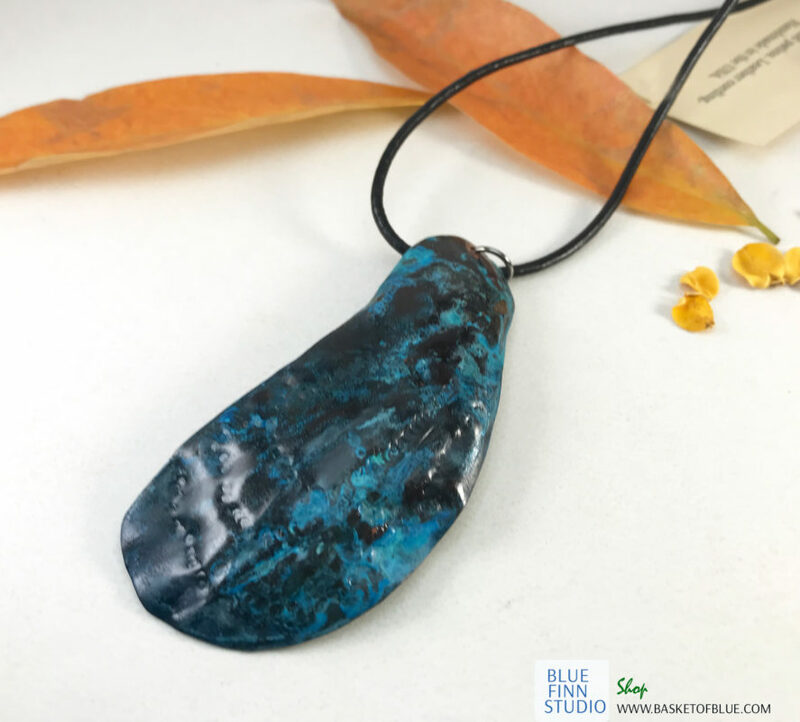 Very popular blue patina, great a bit rustic piece that complements many outfits. Love to have something unique and a bit different? There is no exact match out there! Copper patina verdigris earrings, rustic handmade copper earrings handcrafted from pure copper sheet. Patina is created with all Natural fuming method, patina grows naturally for several days. These copper patina earrings have that organic rustic finish with a geometric shape and beautiful color!